..... 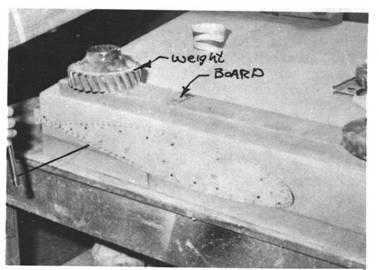 The airfoil-shaped surfaces of your Q2 are formed by hot wire cutting the orange or blue-white styrofoam of 2 lb/ft3 density. The hot wire process given airfoils that are true to contour, tapered, proerly twisted, and swept with a minimum of effort and the simplest of tools. 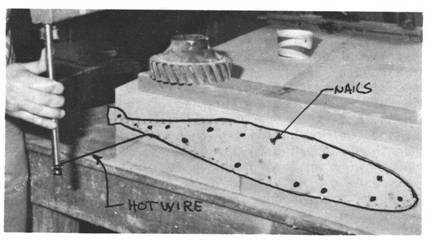 The details for making your hot wire saw were shown earlier. .....The hot wire saw is a piece of stainless steel safety wire, stretched tight between two pieces of tubing. The wire gets hot when an electricial current passes through it and this thin, hot wire burns through the foam. By making smooth steady passes, the hot wire gives a smooth, even surface. The foam offers little resistance to the hot wire's passage. To get a smooth accurate cut, a template is required. Templates are made from thin plywood, sheet metal, masonite or formica. A variable voltage control is used to supply the electrical current that heats the wire. .....The blue-white or orange foam used in your flying surfaces was selected for a combination of reasons and its hot wire cutting ability was one of them. Other types of foams are readily hot wire cut, but some (white expanded polystyrene) have poor physical properties and others (urethane) give off poisonous gases when hot wire cut. Use only the recommended materials! .....Hot wire templates can be made from 1/16 to 1/4 inch plywood, formica, or masonite or .032 to .064 sheet metal. It is important to have smooth edges on the templates. A rough edge may cause the wire to hang up and burn into the foam excessively. Templates are required on both ends of the foam being cut. The size, shape, and orientation of the two templates is varied to taper, and twist the foam core as required. The planform (span and sweep) is set by squaring up the foam block before the templates are used. In general, the trailing edge of the wing is the reference. .....Full-size template drawings are provided in the plans. To make your templates, just glue the template drawings to a piece of plywood or sheet metal and trim to the contours shown. There are a number of markings on each template which aid in the alignment and cutting of the foam core. .....Each template has a waterline (W.L.) marked on it which is used to align the twist of the foam core. Each template's waterline is leveled using a carpenters bubble level. This assures that the relative twist at each template is correct. The template is then nailed to the foam block to obtain the correct planform. ..... Each template has numbered marks running from the trailing edge around the leading edge and back to the trailing edge. These are called "talking numbers." When the foam cores are cut into their airfoil shape, the talking numbers are used to assure that each end of the hot wire is co-ordinated to obtain the correct, tapered airfoil. The person calling the numbers should be at the largest template. A typical cut would sound like this: "Resting on the tab 1/4" from the foam, moving forward, entering foam now - one, half, two, half, . . .,34, half, 35, half, 36, coming out of the foam and pausing on the tab, wire's out." As the cut is made, the person on the small rib follows the numbers, passing over them as he hears them called out. Pause marks are indicated in places where it is necessary to pause for a couple of seconds and let the hot wire's center lag catch up with the ends. 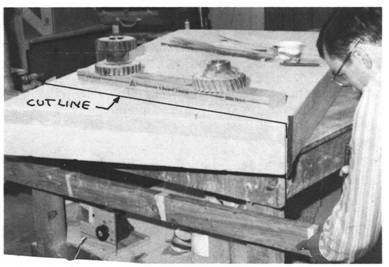 .....Preparing a foam block for an airfoil cut is begun by trimming the rectangular foam block to the basic dimensions for the correct planform. These "trim" cuts are made using two straightedged trim templates. The templates are held against the foam by nails through the template into the foam. Enough nails should be used to hold the template firm so that it won't move when the hot wire is held against it. Cutting straight down along template with a hotwire. Note the diagonal cut being made by correctly positioning the vertical templates and passing the hotwire downward along them. 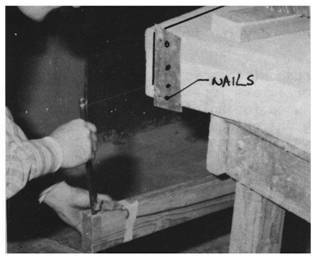 ..... Each template must have holes for nails to hold the templates to the foam; four penny nails are good for this use. The holes in the templates should be a close fit for the nails. Be careful not to angle the nails so that the hot wire can catch on them! Some rib templates are used several times, for both inboard and outboard, requiring you to transfer the talking numbers, pause marks, trim line, and waterline to the opposite side of the template. Support the foam block well; don't overhang the block past the edge of the jigging table.